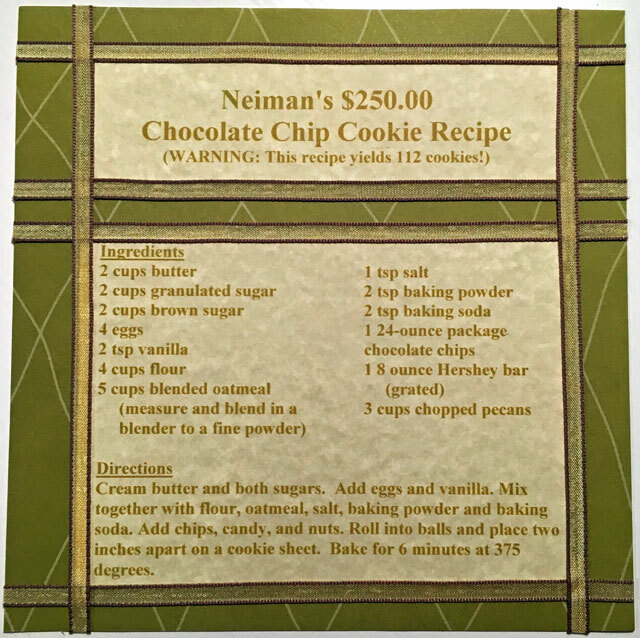 Daily Life - Bits & Pieces: The $250 Neiman Marcus Cookie Recipe "Myth"
Have you heard the story? 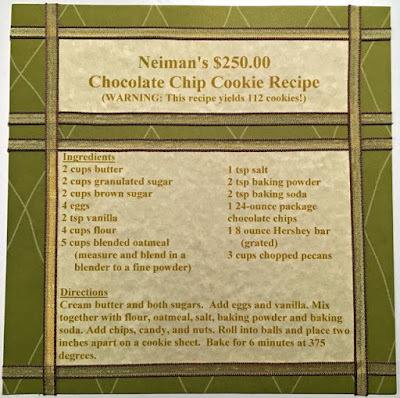 A lady had lunch at Neiman Marcus, enjoyed a chocolate chip cookie for dessert, asked how much the recipe cost, and was told it cost two fifty. She purchased it, had it charged to her account, and when the bill arrived for $250 (!) she called the store to say there was a mistake. When she was informed that the charge was correct, she vowed to share the recipe with as many people as possible. Many (including Neiman Marcus) claim that this story is not true; it's simply a legend or myth that's been passed down. Urban Legend claims this is a myth based on an email that's been circulating since 1996. However, I first received a copy of this recipe, along with the story, sometime around 1990. I really don't know if it's true or not. Of course Neiman Marcus would deny it if it were! It certainly wouldn't be good for business. 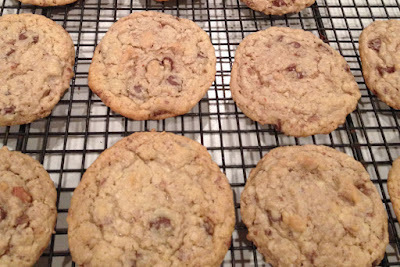 Regardless of the truth of the story behind the recipe, it is an absolutely delicious cookie and well worth gathering the multitude of ingredients needed to make the 112 cookies it yields. 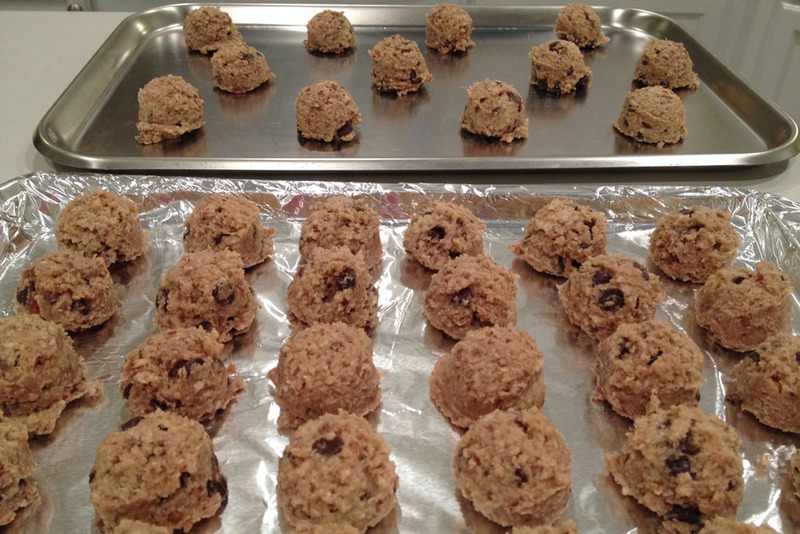 The combination of chocolate chips, grated chocolate, pecans and oatmeal is absolutely divine, in my opinion. 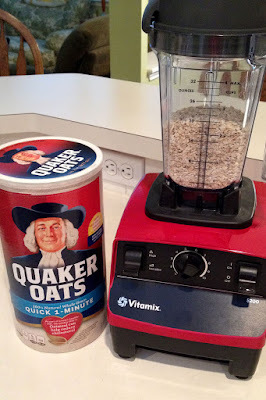 I think one of the things that makes this recipe unique is actually blending the oatmeal before adding it to the batter. This gives the cookie a different texture than a typical oatmeal cookie. The hardest part is waiting for the cookies to cool . . . so we typically enjoy one all hot and gooey (and messy!) right out of the oven. For your enjoyment, here's the full recipe! 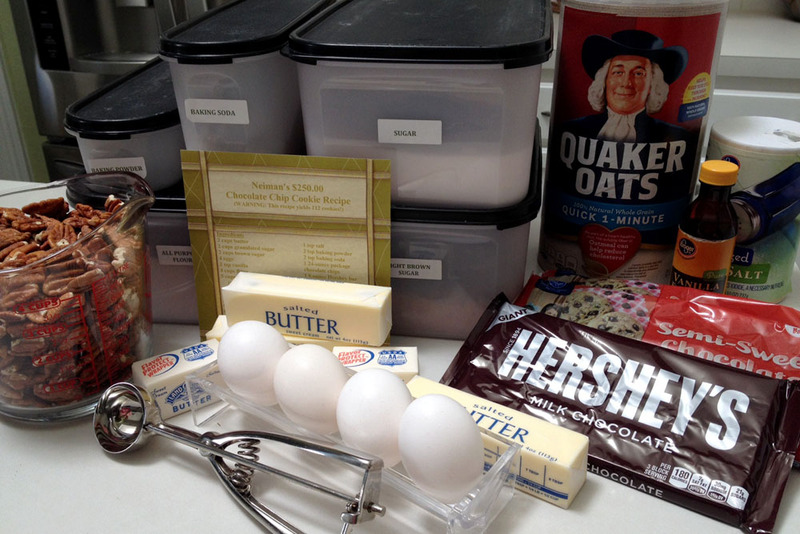 Have you heard the story of this recipe before? What do you think - truth or myth? 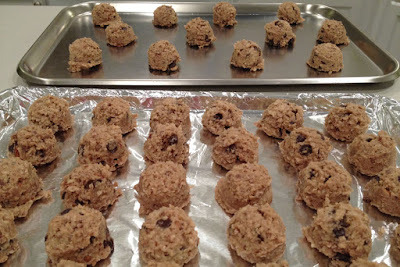 The INSPIRATION for pulling out this recipe and whipping up a batch of cookies was Cate's 31 Days of Cookies blog series! 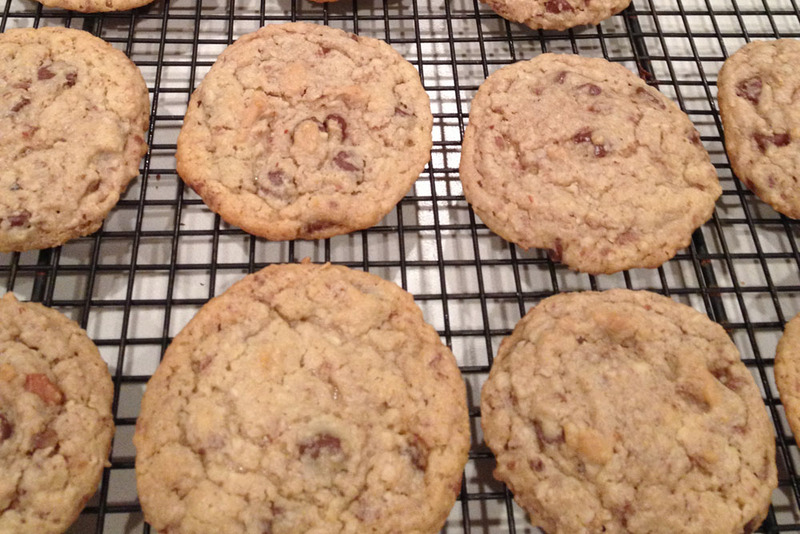 Check it out for more yummy recipes and beautiful cookie photos! I've heard the story in the past but never tried the recipe. I've pinned it so maybe this year! I'd never heard the story about the cookies. I thought it was someone that had just re-created the cookie. However, I'm leaning towards myth. I wouldn't think anyone that had such a good product would give the recipe out even if they did charge for it. But who knows?! Great post Melissa! Thanks for the recipe! I'll have to get a jump on my baking too! I'd forgotten all about that story, and know I have the recipe somewhere in my files. It was a great cookie, and I haven't made it in a long time. Thanks for sharing the recipe, so I don't have to spend hours trying to figure out where I stashed mine! I've heard this story before and it's been around a long time. I've never made it but I love the fact that you can freeze the dough. I might have to try it (minus the nuts) and see how it goes. 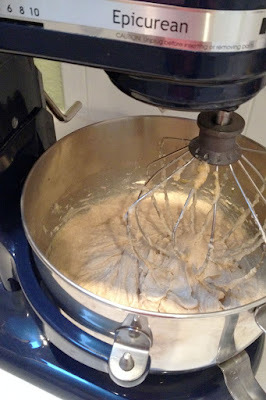 It's new to me, I have to say but the fact that your recipe makes such a lot of biscuits is impressive :). I've never heard this story; but it's a good one. It sounds like some kind of reverse psychology marketing. If it makes this number of cookies I think we'll definitely have to give it a try. Did you get my email about the email from you which bounced back?